Within 2-4 weeks after HIV infection, many, but not all, people develop flu-like symptoms, often described as “the worst flu ever.” Symptoms can include fever, swollen glands, sore throat, rash, muscle and joint aches and pains, and headache. This is called “acute retroviral syndrome” (ARS) or “primary HIV infection,” and it’s the body’s natural response to the HIV infection. During this early period of infection, large amounts of virus are being produced in your body. The virus uses CD4 countto replicate and destroys them in the process. Because of this, your CD4 cells can fall rapidly. Eventually your immune response will begin to bring the level of virus in your body back down to a level called a viral set point, which is a relatively stable level of virus in your body. At this point, your CD4 count begins to increase, but it may not return to pre-infection levels. It may be particularly beneficial to your health to begin ART during this stage. During the acute HIV infection stage, you are at high risk of transmitting HIV to your sexual or drug using partners because the levels of HIV in your blood stream are very high. For this reason, it is very important to take steps to reduce your risk of transmission. During the clinical latency stage, the HIV virus continues to reproduce at very low levels, although it is still active. If you take ART, you may live with clinical latency for several decades because treatment helps keep the virus in check. (Read more about HIV treatment.) For people who are not on ART, the clinical latency stage lasts an average of 10 years, but some people may progress through this stage faster. People in this symptom-free stage are still able to transmit HIV to others, even if they are on ART, although ART greatly reduces the risk of transmission. If you have HIV and you are not on ART, then eventually your viral load will begin to rise and your CD4 count will begin to decline. As this happens, you may begin to have constitutional symptoms of HIV as the virus levels increase in your body. 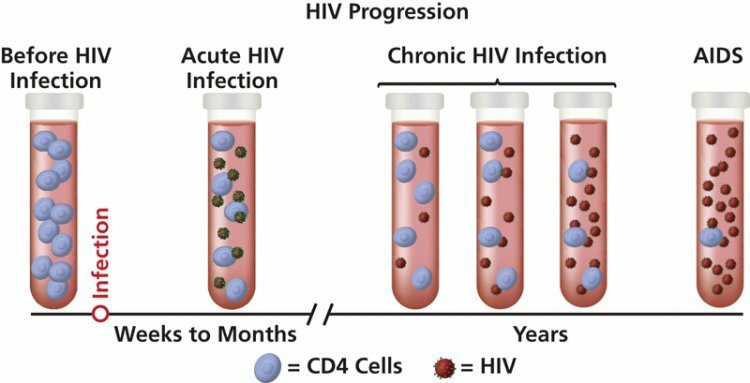 People living with HIV may progress through these stages at different rates, depending on a variety of factors, including their genetic makeup, how healthy they were before they were infected, how soon after infection they are diagnosed and linked to care and treatment, whether they see their healthcare provider regularly and take their HIV medications as directed, and different health-related choices they make, such as decisions to eat a healthful diet, exercise, and not smoke. By making healthy choices, you have some control over the progression of HIV infection. Not everyone is diagnosed early. Some people are diagnosed with HIV and AIDS concurrently, meaning that they have been living with HIV for a long time and the virus has already done damage to their body by the time they find out they are infected. These individuals need to seek a healthcare provider immediately and be linked to care so that they can stay as healthy as possible, as long as possible. Use the HIV Testing and Services Locator to find an HIV provider near you.